Public Uncertain About Effect of Egypt Protests on U.S.
Americans do not have a clear point of view about how the massive anti-government protests in Egypt will affect the United States. More than half (58%) say the protests will not have much of an effect (36%), or offer no response or are noncommittal (22%). Of the minority that thinks the protests will have an effect on the U.S., nearly twice as many say their impact will be negative rather than positive (28% vs. 15%). This lack of agreement notwithstanding, a majority (57%) says the Obama administration is handling the situation in Egypt about right, while much smaller numbers say the administration has shown too much support (12%) or too little support (12%) for the protestors. The latest national survey by the Pew Research Center for the People & the Press, conducted Feb. 2-7, 2011 among 1,385 adults, finds that nearly half (48%) say they have heard a lot about the anti-government protests in Egypt; about the same proportion (52%) reports hearing little or nothing. The survey finds that majorities of Democrats (69%) and independents (57%) say the Obama administration is handling the situation in Egypt about right; fewer Republicans (43%) give the administration positive ratings. Roughly equal numbers of Republicans say the administration is showing too much support (19%) and too little support (15%) for the protesters. Republicans and independents are more likely than Democrats to say the Egyptian protests will end up having a bad effect on the United States. Nearly four-in-ten Republicans (37%) say the protests will have a negative effect on the U.S., while just 8% think their effect will be positive. Twice as many independents say the protests will end up having a negative (28%) rather than positive (14%) effect on the U.S. Among Democrats, as many say their impact will be positive as negative (21% each). Among those hearing a lot about the anti-government protests, 35% think they will have a bad effect on the U.S. while 18% think the impact will be positive. Among those who have heard little or nothing, 21% say the protests will end up having a bad effect on the U.S., while 12% say the impact will be positive. 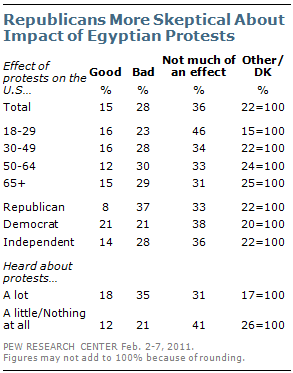 Fully 67% of those who have heard little or nothing about the protests in Egypt say they will not have much an effect on the U.S., express no opinion or volunteer another response, compared with 48% of those who have heard a lot about the protests.